Orbital ATK‘s Cygnus spacecraft re-entered Earth’s atmosphere Wednesday at 9:30 a.m. Eastern Time after it performed three in-orbit scientific missions and delivered approximately 7,900 pounds of scientific experiments and crew supplies to the International Space Station. The atmospheric re-entry of the space vehicle, also known as S.S. Rick Husband, loaded with 4,087 pounds of items for disposal marks the company’s fifth mission to the ISS under its Commercial Resupply Services-1 contract with NASA, Orbital ATK said Wednesday. Cygnus departed the orbiting laboratory June 14 after an 81-day stay there and then initiated the Spacecraft Fire Experiment-I that aims to examine the behavior of large-scale fires in space. After the Saffire-I experiment, Cygnus fielded up to five miniaturized satellites into orbit through the NanoRacks-built CubeSat deployer platform and performed the final experiment that seeks to study the space vehicle’s behavior during re-entry and breakup as part of the OA-6 mission. 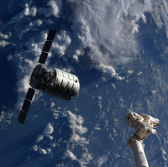 The last experiment involved the use of the Aerospace Corp.-made Reentry Breakup Recorder with Wireless Sensors system designed to record and transmit data on Cygnus’ atmospheric re-entry. The spacecraft launched March 22 from Cape Canaveral Air Force Station in Florida onboard the United Launch Alliance-built Atlas V rocket and arrived at the ISS four days later. Orbital ATK has started the preparation phase for the CRS-1 contract’s OA-5 resupply mission that is scheduled to take off from NASA’s Wallops Flight Facility in Virginia by late summer of 2016.